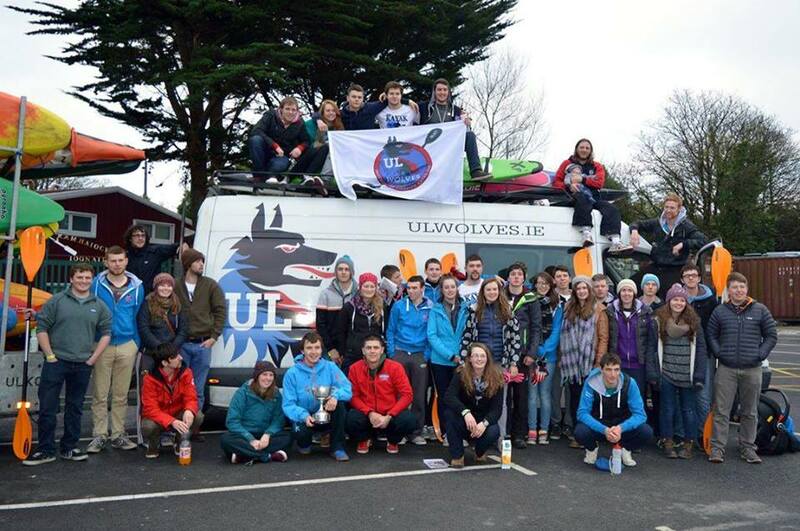 On February 5th 2015, the University of Limerick Kayaking Club attended the Intervarsities hosted by NUIG/ GMIT kayak club with hopes and aspirations to return home with yet another victory. Most people reading this probably know the story, but anyway, from the ground up; the Intervarsities is the annual event where the fifteen or so college kayak clubs in the country come together for a weekend of partying, banter and competing, to see who brings home the coveted big silver trophy! A handful of us set off in the early hours of the morning to participate in the white water events. We had Eoin Keyes, a brilliant all round kayaker, Andrew Regan, a class ‘A’ paddler, Emer Farrell, who has loads of experience and Mark Scanlon, who was just back from a year of studying/paddling in Austria and trip to Mexico. Battling down rapids paddling as fast as they could to achieve a mighty 2nd place overall. We then headed over to the Claddagh Basin for Kayak-Polo. For anyone who has not witnessed the sport before, it’s a 5 a side match that combines kayaking and ball handling skills with an exciting contact team game, where tactics and positional play are as important as the speed and fitness of the individual athletes. Each college, represented by hardened polo players ready to do what they do best. Polo was never our strong point although after a long day of paddling hard and firing shots through the back of nets we managed to place 3rd overall in the competition, a great achievement as we hadn’t got that far before in this competition. Later on that night, the entire club had arrived at the Sleepzone hostel who were kind enough to allow some overly energetic kayakers stay the weekend. At 6:30am the next morning we were stirred by the sound of alarm clocks going off that were harmonised by the overly fatigued moans of kayakers throughout the hostel. At 8:00am we arrived at the centre for the GP and HP registration. Once gear and boats were sorted we strolled on down to the river to wait for our race. 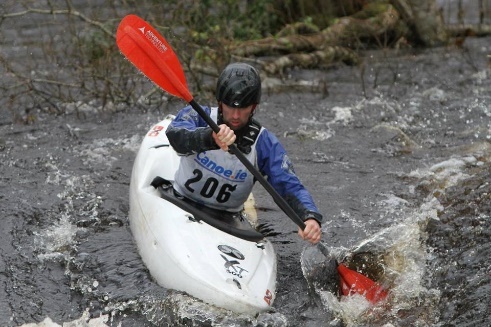 For the fresher’s you could see a new level of fear growing inside them as they were being told they had to kayak 5km up and down a river without any breaks in the GP category and 10km up for those competing in the HP category. A tremendous task for any kayaker. In these events we went as individuals racing against each other. Eoin Keyes and Mark Scanlon took 1st and 2nd place in the GP men’s category, Gavin Sheehan and Eoin Farrell achieved 2nd place in the GP men’s duo category, and everyone who competed made a great effort. We continued straight from the Upper Corrib back to the Claddagh basin for freestyle, as the water levels were too low to venture to the original destination in Tuam. Our highly skilled team of Eoin Keyes, Andrew Regan, Eoin Farrell and Caoimhe Farrell represented the ULKC with every trick in the book displaying levels of technique that would take years to master. Andrew Regan was targeted in the banter league after moving from NUIG to UL and was to be hit with the biggest fruit, to gain ‘Banter-points’, so you could imagine it was quite the spectacle seeing dozens of pieces of fruit being flung towards him, he still managed to execute some impressive manoeuvres. On Sunday morning we were up bright and early for the boater cross event after the Mexican themed party held the night before. 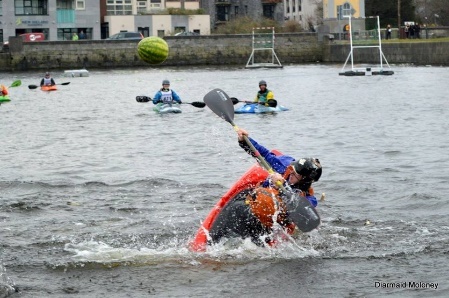 A new event in varsities that consisted of 5 people kayaking down the white water of the Lower Corrib River in an attempt to get to the finish line by any means possible. It really isn’t for the faint hearted. It was limited to a select few as Galway was carpeted in fog. Five of our paddlers got through to the second round of the boater-cross, which we were very happy with. To finish off the weekend we had a ceremony in NUIG where the winners of each event were announced including the entire event itself. Various colleges were winning several events each which made us nervous for the overall outcome and even right up until the end it was there for the taking by anyone. We lit up with delight when it was announced that ULKC had won the Intervarsities for the sixth year in a row. We then proceeded to set off back to Limerick with the trophy in hand happy out with our victory.